Videos by: Eve Bailey, Christian Croft & Andrew Scneider, Celeste Fichter, Maud Haya-Baviera, Gareth Hudson, plan b and Katharine Tolladay. 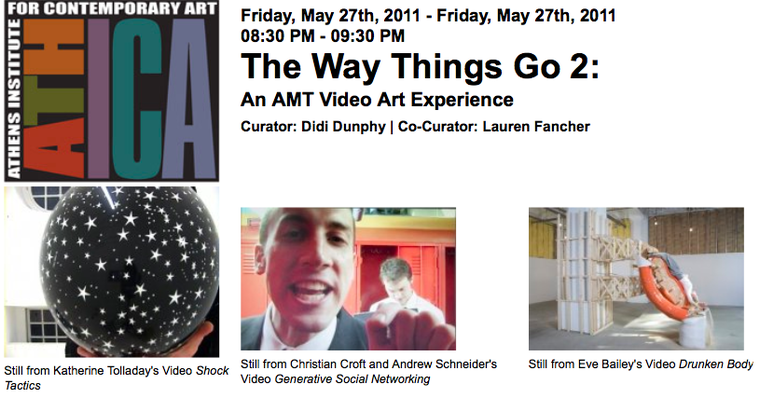 Co-curated by Didi Dunphy and Lauren Fancher, the screening will be presented on the Adjustable Media Theater, a new portable video-viewing environment created by The Way Things Work participating artist Ernesto R. Gomez in collaboration with David Mitchell. The AMT was funded by ICE (The University of Georgia’s Ideas for Creative Exploration). The video artworks are amusing, shocking, and enlightening; for instance in Shock Tactics Katharine Tolladay inflates a balloon until it explodes; in Christian Croft and Andrew Schneider’s piece Generative Social Networking they humorously demonstrate the tongue-in-cheek potential of social media to anonymously connect individuals; and in Eve Bailey’s two works, Drunken Body and Work Force, her over-the-top use of large mechanical structures for impractical purposes demonstrate the artist’s quirky penchant for bizarre balancing acts and use of body mechanics. Other videos are by Celeste Fichter, Maud Haya-Baviera, Gareth Hudson and plan b. 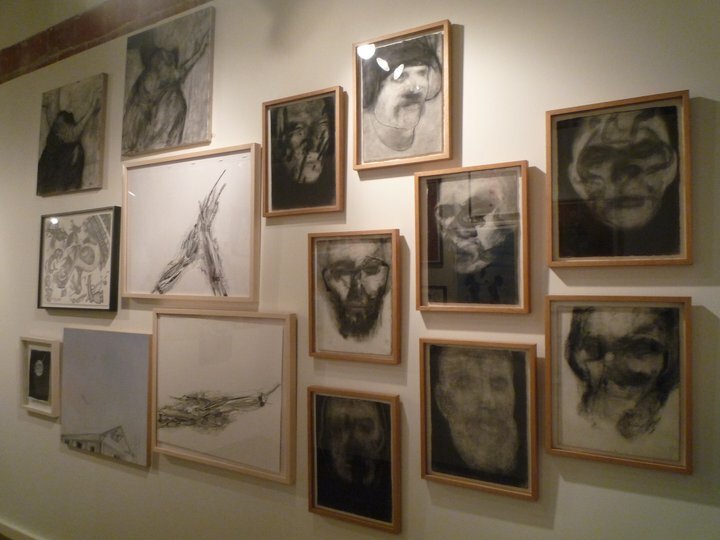 Installation view, drawings by: Eve Bailey, David Colosi, Chris Sauter and Marko Velk. Fair Chance from Eve Bailey on Vimeo. Fair Chance is a short surrealistic tale that questions the values of the art market. The two main protagonists are the “artist” and the “auctionneer”. Fair Chance was created in the context of Special Features, a project by Residency Unlimited, curated by Marie Losier and Sebastien Sanz de Santamaria. Adam and Eve appropriated the Surrealist method of the exquisite cadaver to overcome the project’s restrictions. Here process plays a role equally as important as the final product. On May 7th at Millennium Worshop, Residency Unlimited is proud to present the film screening of 12 newly created short film and video works that were realised for “Special Features” at Kumukumu Gallery (L.E.S) in January 2010. 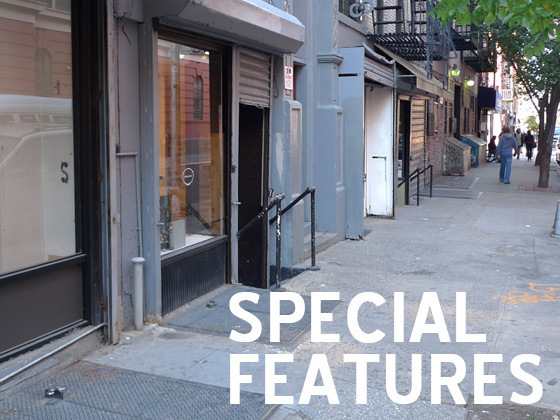 Special Features was co-curated with Marie Losier. The screening is part of Millennium’s “Spring 2010 Personal Cinema Series” program. Artists: Adam & Eve , F. P. Boué, Francisca Caporali, Bradley Eros, Juliana Francis-Kelly, Brian Frye & Penny Lane, Camille de Galbert, Peter Hristoff, Andrew Lampert, Marie Losier, Jackie Raynal, Joel Schlemowitz. With a live soundtrack by Séance (the ensemble), with roe enney, Antiquity, Lary 7, & Eros accompanying Bradley Eros’ work “Séance”. In January 2010, Residency Unlimtied curated a month long residency initiative for 12 local filmmakers who were invited for a day long residency each at the Kumukumu gallery. ‘Special Features’ used a simple yet precise set of constraints designed to maximize the time, space and resources available in order to produce new works of short film. Residency Unlimited converted the gallery space into a low cost film studio, containing all the necessary ingredients for filming a movie: cameras, lighting, costumes, props, backgrounds, staging, etc. Artists, filmmakers, musicians, and performers were invited to use the space and equipment to each make a film over the course of one workday. The artists were challenged to see the possibilities within these limits in order to make a compelling work – an exercise in resourcefulness. April 2011, residency at I-Park under the invitation program. 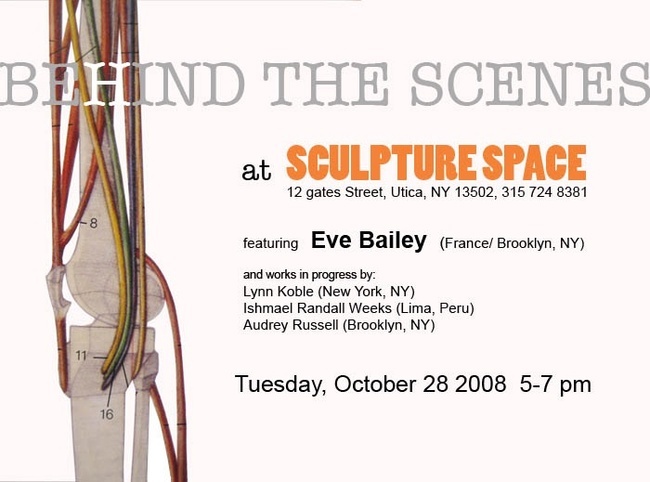 Invited artists: Eve Bailey, Barbara Bartos, Claudia Dinep, Elise Morris and Run Shayo. I-Park is a 450-acre woodland retreat in rural East Haddam, Connecticut. The property consists of ponds, hills, streams, stone outcroppings and sheer cliffs. 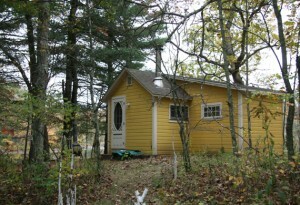 It has wild fields and new growth forest, as well as miles of stonewalls and walking trails. It is bisected by the Eight Mile River and adjoins the Devil’s Hopyard State Park and other preserved tracts. The land has a wild, gnarly character that suits I-Park’s role as a refuge from and recourse to the safe routines and subtle compromises of the workaday world. I-Park aspires to take these natural gifts and create a special space where the important work being done by solitary individuals in their artistic and intellectual pursuits is encouraged and celebrated – a living, three-dimensional environment/community uniquely conducive to the creative process. I-Park is itself a long-term creative project in its early concept and development stages. It is evolving slowly and patiently, with an eye to long-term relevance and viability. A project co-curated by Residency Unlimited and Marie Losier. 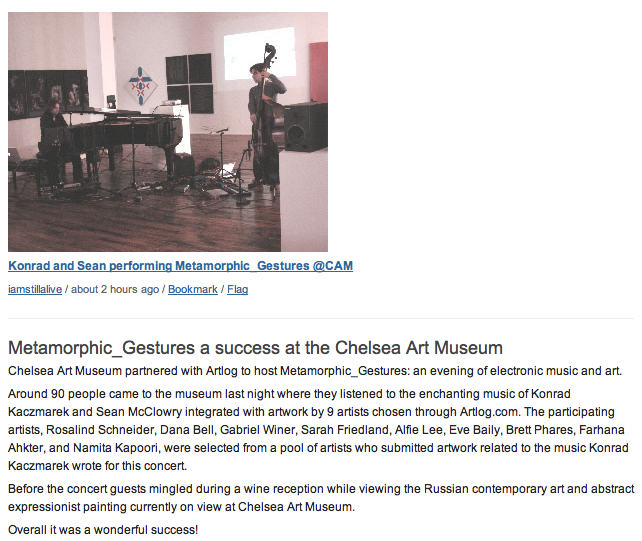 Conceived as a short term residency project, Special Features was realized at the Kumukumu gallery, 42 Rivington street (NYC) in January 2010. For 1 month, Residency Unlimited converted the gallery into a low cost film studio, containing all the necessary ingredients for filming a movie: cameras, lighting, costumes, props, backgrounds, staging, etc. A select group of artists, filmmakers, musicians, and performers were invited to use the space and equipment to each make a film over the course of one workday (eight hours) – an exercise in resourcefulness. Each participant was instructed to follow a simple yet precise set of constraints designed to maximize the time, space, and resources available. Under these conditions, lines between actors and crew, film set and back stage, equipment and props fuse, allowing the event to be considered as one collaborative installation/performance. Here process plays a role equally as important as the final product. Viewable to the public, the film shoot becomes the work, whether in an active or inactive stage. Née en 1975 à Nancy et installée à New York depuis 2002. Eve Bailey utilise son propre corps comme outil de travail et matière première dans la réalisation de vidéos, de sculptures et d’ installations basées sur des actions-performances. Dans l’ oeuvre intitulée ‘Such a Pretty Girl. Behave Yourself.” (Une Si Jolie Fille. Tiens-toi bien. ), l’ artiste fait une galipette en talons hauts sur un escabeau adapté à cet effet, enfreignant avec humour les normes d’ utilisation et les règles de bonne conduite. Dans la vidéo ‘Corps Ivre’ , elle s’ approprie l’ esthétique des chantiers des rues de Brooklyn et met son propre corps en chantier à la manière d’ un Sisyphe moderne. A l’ occasion de son exposition à l’espace Window, elle présente une série de dessins préparatifs pour son prochain projet de vidéo intitulé ‘Xs’ (titre provisoire). Eve Bailey est diplômée de l’ Ecole des Métiers d’ Arts Olivier De Serres (1996) et de l’ Ecole des Beaux- Arts de Paris (2001). Elle obtient deux bourses d’ étude – française et américaine – pour un séjour d’ un an à l’ Institut d’ Art de San Francisco durant lequel elle se familiarise avec l’ art de la performance. Elle entreprend des actions insolites dans les lieux publiques – bus, restaurants – et les galeries (1999). C’ est à son retour à Paris en 2000 qu’ elle intègre le mouvement corporel à son travail de sculpteur puisant dans ses acquis en danse classique et dans les arts martiaux. Son travail a été exposé et projeté en France, en Allemagne, aux Pays Bas, aux Etats-Unis et à Cuba. 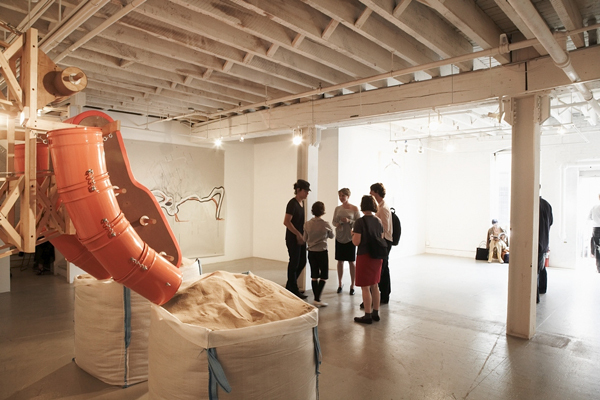 Les expositions récentes incluent On The Edge, A-1 Lab Art Space à Knoxville (TN), 30 second spot, Cuchifritos Gallery et Metaphoric Gestures, Chelsea Art Museum à New York. Les résidences subventionnées incluent Triangle (New York, NY, 2003), Sculpture Space (Utica, NY, 2008) et très prochainement Bemis Center à Omaha (NE) en Août, Septembre et Octobre 2009.